To save to your computer, right click on selected link and select "save target as" or "save link as," browse for the folder (or desktop) where you want to save the journal and click save. Click the bookmark icon* (see green arrow) and click on any chapter or heading. In bookmarks, click on "Table of Contents" and then click either the title or the page number – you will go right to the item. In bookmarks, click on "Index," find your alphabetized item and click on the page number. Ch. 8, Reports of Conference Officers, Boards & Agencies, click on "DRAFT Operational Guidelines," turn one page to find a list of the contents of the new conference plan. Ch. 10, Standing Rules, click on "Contents of Standing Rules." Ch. 16, Directory of Churches, click on "Alphabetical Index of Church Names." 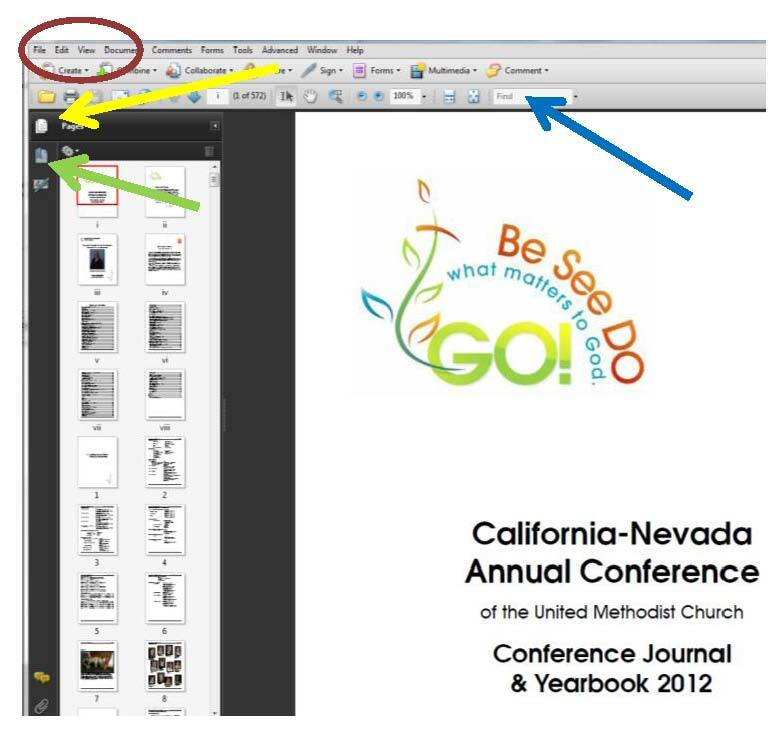 At the top of the PDF document is a box with the word "Find" (see blue arrow). Enter any name, word or phrase and press the "Enter" key. The search engine will find all instances of that item in the Journal. If the first match isn't what you are looking for, click one of the icons to the right of the "Find" box to search backward or forward. Due to the size of the file, download time may vary by computer, so please be patient.